Tiger Woods is in the field this week for his first full stroke play tournament since the Tour Championship, as a star studded field is in Turkey for the 2013 Turkish Airlines Open. Tiger teeing it up is always the focus and that won’t change this week in Turkey. The last time we saw him, he was participating in his hit and giggle with Rory at Mission Hills, and he played well in the loss despite not having picked up a club since the Presidents Cup two weeks prior. And since it seems to be part of everyone’s story this week, we might as well mention that Tiger likely received his reported $3 million appearance fee to show up. Not a bad payday. Outside of that, this is the last chance for players to crack the top 60 in the Race to Dubai, which grants entry into next week’s DP World Tour Championship, the season finale on the European Tour. The Montgomerie Course is in excess of 6486 m and plays to a par of 72. It’s supposed to be a gorgeous course, and with all of the hazards in play, it will likely provide a stiff challenge to the players this week. I’m definitely looking forward to seeing how it looks and plays. Tiger Woods: He’s the heavy favourite coming in here even though he hasn’t played in a real tournament in about six weeks, and there’s another thing to consider here too: Tiger’s a creature of habit, and in recent years, he hasn’t fared overly well on courses he hasn’t seen before. With a very high quality field, he won’t be beating a bunch of nobodies if he can come away with a win. At roughly 5-1, there isn’t much value here, but you should always expect that he’ll be in contention. Justin Rose: Rose was one of eight players who played in the World Golf Final in Turkey last year, and he won that high money shootout against Tiger, Rory, Lee Westwood and others. Outside of that, he hasn’t played in Turkey before, but he’s coming off of a good performance in China last week where he ended up in solo fifth. Martin Kaymer: Is it possible that Kaymer is getting the form back that made him the world’s number one player? Four straight finishes inside the top-13, including a T8 last week at the HSBC that included a third round 62. Ian Poulter: Poulter’s runner-up finish at the HSBC last week evoked memories of his Ryder Cup run at Medinah, where everything was dropping and Poulter looked unbeatable. He’s a very streaky player who has played well in his last two tournaments, and is in the middle of tournaments in four consecutive weeks. Henrik Stenson: Stenson has put up some low numbers in his last two tournaments, but he’s also had some ugly rounds too, leading me to believe that his wrist isn’t fully healed. Until we see him get back into the top-25 again, I’d lay off. When it comes to a course that no one has seen, anything can happen here so I’m going to play it a little safe with the selections here. The other thing that you want to look for are players who have very adaptable games, where their skill sets are usually applicable regardless of where they are. I mentioned my reasons above. Kaymer looks really solid right now, and it’s about time he picked up another win, plus there’s a good chance that he’s on the outside looking in right now for the European Ryder Cup team, and a win here would go a long way to securing that spot. This is based purely on form here, as Poulter looked really good last week and will likely keep that up based on his streaky nature. 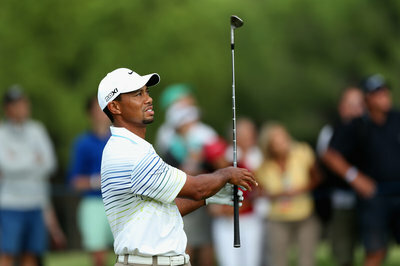 The putter, which is usually his best friend but wasn’t for most of 2013, has been really on point in the last two weeks. I have a rule when it comes to Schwartzel that says if he’s available at 20-1 or higher, he needs to be taken unless he’s had a terrible time at that course for the week. It just so happens that he’s coming off of a win in his last start at the China Masters, so he’s in good form. He’s probably the best lock for a top-10 finish this week, with the chance for much more if he’s on point. I’ve been on the record in the past as a big Oosthuizen fan, and he had a rough year with some injuries and inconsistent play. Last week in Shanghai, he cracked the top-20 for the first time since the Greenbrier in July, which tells me that he could finally be starting to feel better. The best swing in the game right now ranked second last week in GIR percentage, hitting 81.9% of the greens at Sheshan. Manassero is one of the best putters and short game players in the world, but he hasn’t had the best time since winning the BMW PGA at Wentworth at the end of May. He likely won’t put himself in too much trouble from the tee, and his T-21 last week was his best finish since the first week of June. Everyone’s favourite golfer is very much like Manassero in that he’s a good putter who usually puts the ball in the middle. Hasn’t done much since his runner-up finish at the KLM Open in September, but the price is right here, especially on an each-way finish.